There is no argument, that today's environment of increased pollution from chemical, toxic emission and the breakdown of our ozone creates extra problems for us. We need to provide total nutrition to our bodies everyday according to Senate Doc. 264. We can not count on the 4 basic food groups to supply us adequately for these nutritional needs. 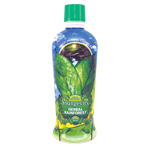 Majestic Earth Herbal Rainforest is a step in the right direction. Each Bottle contains full strength Majestic Earth Plant Derived Minerals along with 16 herbs to balance your everyday needs, along with various nutrients as listed below. 16 Herbs in a base of full strength Plant Derived Minerals. A major antioxidant nutrient, protects cell membranes may prevents free radical generation.